^ Yen, A., et al. 2005. An integrated view of the chemistry and mineralogy of martian soils. Nature. 435.: 49-54. ^ Squyres, S. et al. 2004. 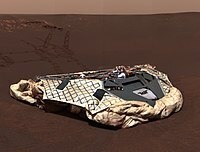 The Opportunity Rover’s Athena Science Investigation at Meridiani Planum, Mars. Science: 1698-1703. ^ Soderblom, L., et al. 2004. 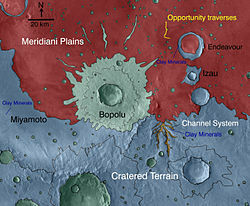 Soils of Eagle Crater and Meridiani Planum at the Opportunity Rover Landing Site. Science: 306. 1723-1726. ^ Christensen, P., et al. 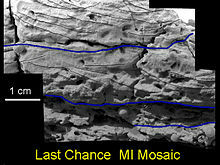 Mineralogy at Meridiani Planum from the Mini-TES Experiment on the Opportunity Rover. Science: 306. 1733-1739. ^ Goetz, W., et al. 2005. Indication of drier periods on Mars from the chemistry and mineralogy of atmospheric dust. Nature: 436.62-65. ^ Bell, J., et al. 2004. Pancam Multispectral Imaging Results from the Opportunity Rover at Meridiani Planum. Science: 306.1703-1708. ^ Christensen, P., et al. 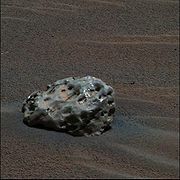 2004 Mineralogy at Meridiani Planum from the Mini-TES Experiment on the Opportunity Rover. Science: 306. 1733-1739. ^ Squyres, S. et al. 2004. In Situ Evidence for an Ancient Aqueous Environment at Meridian Planum, Mars. Science: 306. 1709-1714. ^ Hynek, B. 2004. Implications for hydrologic processes on Mars from extensive bedrock outcrops throughout Terra Meridiani. Nature: 431. 156-159. ^ Klingelhofer, G. et al. 2004. Jarosite and Hematite at Meridiani Planum from Opportunity’s Mossbauer Spectrometer. Science: 306. 1740-1745. ^ Squyres, S., et al. 2009. Exploration of Victoria Crater by the Mars Rover Opportunity. Science: 1058-1061. ^ Schroder,C., et al. 2008. J. Geophys. Res: 113. ^ Clark, B. et al. Chemistry and mineralogy of outcrops at Meridiani Planum. Earth Planet. Sci. Lett. 240: 73-94.